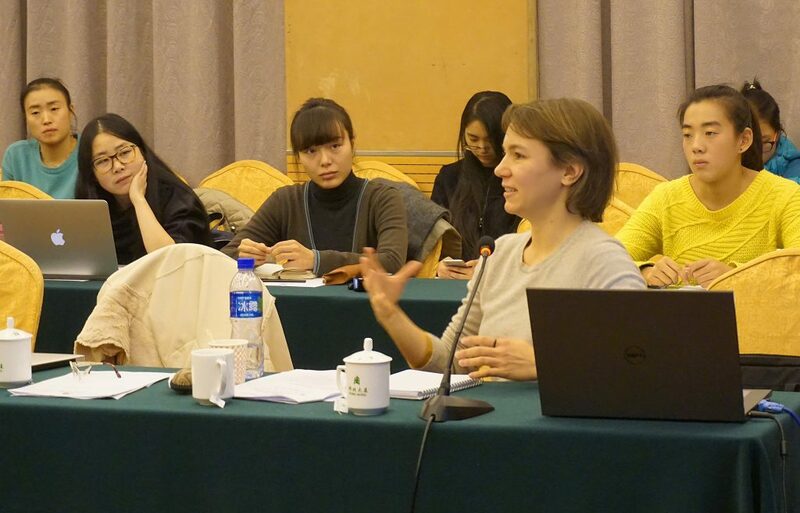 On the occasion of the Beijing Dance Academy Department of Dance Studies’ thirtieth anniversary a conference took place entitled ‘The Development Forum of Dance Studies’ in November 2015. I was privileged to be invited to participate in the event with three further colleagues from Middlesex University, amongst them Prof. Chris Bannerman, Head of ResCen and Co-Director of ArtsCross. Various events took place throughout the day, which were informative with regard to the status of dance as an evolving practice that is being taught as well as researched. Different institutions were represented – next to Beijing Dance Academy there were contributions by representatives from Nanjing University of the Arts, Taipei National University of the Arts, Minzu University of China and Middlesex University London. I witnessed the second day of the conference, which featured a wide range of presentations with the particular thematic focus ‘The Chinese Minzu dance with international outlook’, organised by the Research Centre for Minzu Dance. Minzu translates as nationality or ethnic group, and there are apparently a range of traditional Chinese dance forms grouped together under the term ‘minzu wudao’ or minzu dance – often (perhaps not satisfactorily) translated as ethnic dance. 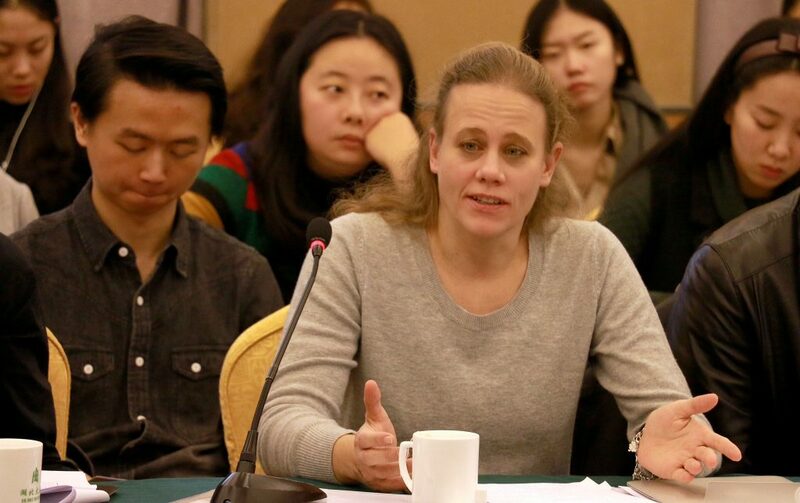 As a European I have found it fascinating to witness what I perceive to be an a forceful and ever-increasing interest in and preoccupation with questions around a particular Chinese identity in the art and dance works I have experienced when visiting China several times over the past few years. It seems that many factors are at play here, not least the rapidly changing urban landscape, living standards and other major changing social factors that make China of today a very different place to the one experienced by the previous generation. (We only need to recall widely known images showing Shanghai in the 1990s and 2010 – at the former time featuring green unused land, whereas twenty years later the same spot already boasted some of the world’s most modern skyscrapers.) It does not seem surprising that questions around identities get raised, and in this fast development I have enjoyed witnessing a simultaneous ‘looking back’ in time, a querying and what I interpret as processes of rediscovery of possible and unique roots, at this time when the country overall moves ahead at such rapid speed in terms of its development. Within the dance world specifically it might not seem surprising that students at Beijing Dance Academy – and other dance training institutions in China as well as Taiwan – train next to classical ballet also traditional Chinese dance forms. Yet perhaps owing in great parts China’s recent history including the Cultural Revolution as well as the rapid-changing environment mentioned above, there seems to me a perceivable sense of re-engagement, rather than a steady continuation, with traditional dance practices, as part of this search for something that is uniquely ‘Chinese’. Many questions seem to be continually addressed around what these dance forms are and what their future might be. Intriguingly, as it became apparent in some of the presentations, this re-engagement with traditional dance forms actually constitutes an active interpretative venture on behalf of dance researchers and dance educators. Many dance forms have been lost and forgotten, and much work seems to be done in trying to recreate traditional dance forms, in parts from ancient cave paintings as well as other artworks, such as painted vases. Needless to say, these static representations might only give clues as to what live dance practices may have been like and this is where such an undertaking by necessity is interpretative and inventive, yet, I wonder, is would it at any rate be important to get it ‘right’? I picked up on questions of authenticity in relation to issues around identity that are foregrounded in such undertakings and was reminded of Jacques Derrida stating in his publication Archive Fever: A Freudian Impression (Derrida, 1995), that beyond the past it is the future that is given in an archive. What matters, it seems, is less what actually existed in its detail in the past, but it is instead the various current engagements and preoccupations with minzu practices and the particular evolvements these are experiencing, the statuses and meanings these are gaining and the visibility they may be attaining, that is of importance. 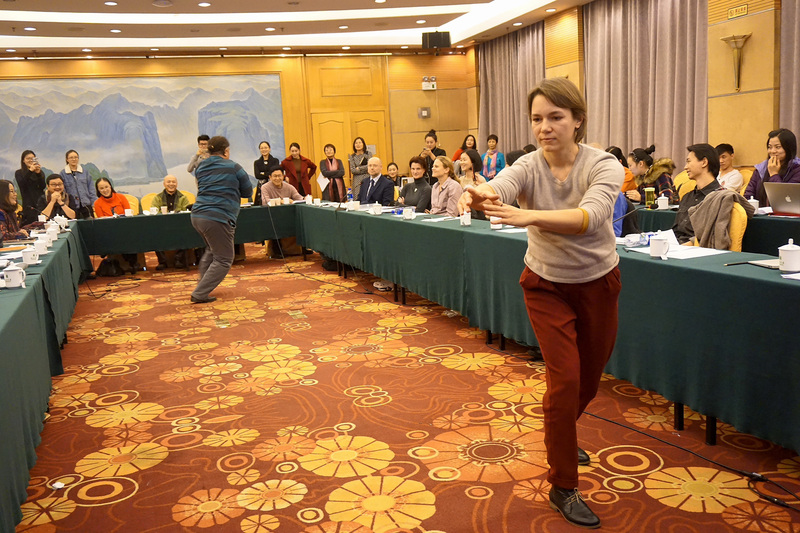 One of the presentations as part of the programme of events presented a pedagogic approach within minzu dance traning. Due to the prominence of ballet training in Chinese dance conservatoires, it was stated, dance teachers and students across China have been accustomed to a certain regiment in terms of training. The strengths of ballet training were highlighted in terms of the syllabi it offers, noting that these forms became highly influential in an ongoing development of minzu dance training. Dance students demonstrated a typical movement routine in class, where movements of minzu dance were practised in similar routines to those that ballet offers. Interestingly, my ArtsCross colleague from the Taipei National University of the Arts however explained to me that minzu dance is taught very differently in Taiwan – again bearing witness to the creative aspect at stake in processes of re-engagement with dance practices that may have been lost in parts, at least in official dance training institutions. Various voices from Chinese delegates throughout the conference conveyed a passion for Chinese traditions and a perceived need to instill this passion to younger generations, so that these practices will gain more prominence again, at a time where China develops so fast that her near future can hardly be guessed or grasped. My own short contribution to the event was an attempt to question whether a narrow approach to questions around authenticity when dealing with traditional practices in an attempt to ‘recreate’ would perhaps take an important aspect of dance practice away – its ability to ever-evolve. Witnessing these sorts of processes pursued with an impressive energy and dedication was most fascinating for me to in my recent trips to China.